When hanging out around the campfire with friends, you need a simple, durable camp cup to keep your favorite beverage close at hand. The double-wall insulated design holds in hot or cold while the Sip-through lid ensures that you won't spill a drop. Clean and durable, made of pure 304/18-8 stainless steel, this double-walled insulated camp cup keeps hot and cold beverage temperatures steady without burning hands or forming condensation. The convenient sip-top keeps bugs out and helps prevent sloshing. 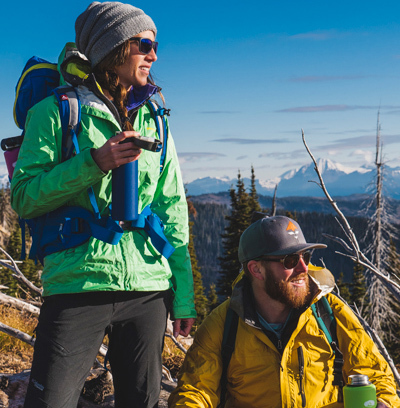 Double wall insulation helps keep your beverage warm and protected while on the go. Elegant press-fit lid ensures that you won't spill a drop of your favorite beverage. CAUTION: Not for stovetop, microwave or oven use. Do not freeze. Not for use with acidic substances. Contents may be very hot. Do not fill with carbonated or fermentable beverages. Always ensure that lid is closed securely before transport. Handle with care. Keep out of reach of children and pets. Hot liquids can burn. WARNING: Hand wash with mild detergent in hot water after use. Always rinse cup before and after each use. Only use non-abrasive cloths and cleaners. Dishwashers may prematurely age components. Do not expose to bleach or cleansers containing bleach or ammonia. Flavor may be affected if used to store liquids for longer than three days continuously.